District town in the government of Volhynia, Russia. The Jews of Kremenetz are first mentioned in a charter of privileges granted by the grand duke Svidrigaila of Lithuania May 9, 1438, to the waywode of Kremenetz, the German Yurka. In this charter the latter is given jurisdiction over the Ruthenians, Poles, Wallachians, Germans, Armenians, Jews, and Tatars of the town. The next mention of Jews is under date of March 15, 1536, when Kremenetz had come under Polish rule. At that time King Sigismund granted the Magdeburg Rights to the city, which deprived the Jews of certain commercial advantages. In an edict of Nov. 27, 1551, the Jewish community of Kremenetz is mentioned among those exempted from the payment of the special tax known as "Serebschizna" (tax on silver). This shows that it was not in a prosperous condition at that time—a conclusion which is sustained by the fact that in 1552 there were only 48 Jewish house-owners in the town. A few years later, however, wealthy Jewish merchants bid successfully on certain leases. In 1556 the Canon of Plock (Plotzk) and Warsaw, Yan Makovetzki, who was sent by the king to investigate the administrative affairs of the castle of Kremenetz, reported that Avram (Abraham) Mosheyevich and Pesakh Khaimovich, Jews of Kremenetz, bid for the lease of commercial taxes, inns, etc., the sum of 300 kop groschen per annum, an amount greatly in excess of that paid by the Christian leaseholders, the aldermen Semashko and Kuibyeda. The king's reply, characteristic of the contemporary policy of the Polish court, was: "We should always endeavor to increase our income from the towns and castles; and through the competition of the Jews the value of our leases has always increased. This competition may impel the Christians to bid even more." Hence the king ordered that the leases be awarded to the Jews. The success of the Jewish tax-farmer Avram Mosheyevich led to an attempt at retaliation by the previous tax-farmer, the alderman Semashko, as appears from a document dated July 4, 1557. In a lawsuit brought by the Jew Eska Zelmanovich against Avram Mosheyevich, Semashko, who acted as judge, decided in favor of the former, but the decision was reversed on appeal to the king, who had ordered the case to be brought before him. Five other Jewish leaseholders, Levon Itzkhakovich, Pesakh Khaimovich, Moshe and Yanush Davidovich, and Eska Kheskilovich, are mentioned in a document dated Dec. 15, 1557. The prediction of the king as to the increase in revenue owing to the competition of the Jews was fulfilled; for it appears that the leases and taxes of Kremenetz, which formerly had been farmed for 450 kop groschen per annum, were now leased for the annual sum of 600 kop groschen to a non-resident, the Jew Jacob Felixovich, son of the well-known Felix, manager of the Wilna mint. In the second half of the sixteenth century the community of Kremenetz was much less important than those of other Volhynian towns, as is evidenced by the apportionment of taxes among the Jewish communities of Lithuania on July 25, 1563. 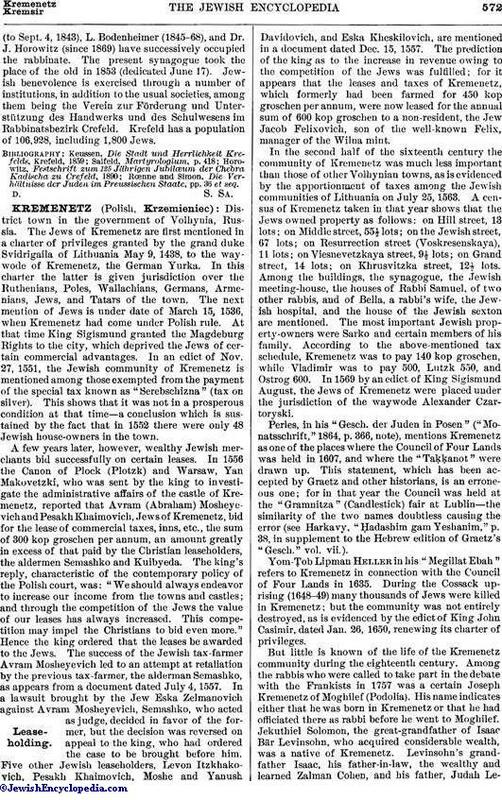 A census of Kremenetz taken in that year shows that the Jews owned property as follows: on Hill street, 13 lots; on Middle street, 55½ lots; on the Jewish street, 67 lots; on Resurrection street (Voskresenskaya), 11 lots; on Viesnevetzkaya street, 9½ lots; on Grand street, 14 lots; on Khrusvitzka street, 12½ lots. Among the buildings, the synagogue, the Jewish meeting-house, the houses of Rabbi Samuel, of two other rabbis, and of Bella, a rabbi's wife, the Jewish hospital, and the house of the Jewish sexton are mentioned. The most important Jewish property-owners were Sarko and certain members of his family. According to the above-mentioned tax schedule, Kremenetz was to pay 140 kop groschen, while Vladimir was to pay 500, Lutzk 550, and Ostrog 600. In 1569 by an edict of King Sigismund August, the Jews of Kremenetz were placed under the jurisdiction of the waywode Alexander Czartoryski. Perles, in his "Gesch. der Juden in Posen" ("Monatsschrift," 1864, p. 366, note), mentions Kremenetz as one of the places where the Council of Four Lands was held in 1607, and where the "Taḳḳanot" were drawn up. This statement, which has been accepted by Graetz and other historians, is an erroneous one; for in that year the Council was held at the "Gramnitza" (Candlestick) fair at Lublin—the similarity of the two names doubtless causing the error (see Harkavy, "Ḥadashim gam Yeshanim," p. 38, in supplement to the Hebrew edition of Graetz's "Gesch." vol. vii.). Yom-Ṭob Lipman Heller in his "Megillat Ebah" refers to Kremenetz in connection with the Council of Four Lands in 1635. During the Cossack uprising (1648-49) many thousands of Jews were killed in Kremenetz; but the community was not entirely destroyed, as is evidenced by the edict of King John Casimir, dated Jan. 26, 1650, renewing its charter of privileges. But little is known of the life of the Kremenetz community during the eighteenth century. Among the rabbis who were called to take part in the debate with the Frankists in 1757 was a certain Joseph Kremenetz of Moghilef (Podolia). His name indicates either that he was born in Kremenetz or that he had officiated there as rabbi before he went to Moghilef. Jekuthiel Solomon, the great-grandfather of Isaac Bär Levinsohn, who acquired considerable wealth, was a native of Kremenetz. Levinsohn's grandfather Isaac, his father-in-law, the wealthy and learned Zalman Cohen, and his father, Judah Levin,who also was a wealthy merchant and was equally popular among Jews and Gentiles, likewise lived there. At the beginning of the nineteenth century Kremenetz gained fame through its son Isaac Bär Levinsohn, "the Russian Mendelssohn," as he was sometimes called. His presence there attracted to Kremenetz many scholars and friends of learning. Levinsohn's friend, Mendel Landsberg, was known in the literary world for his extensive collection of books. 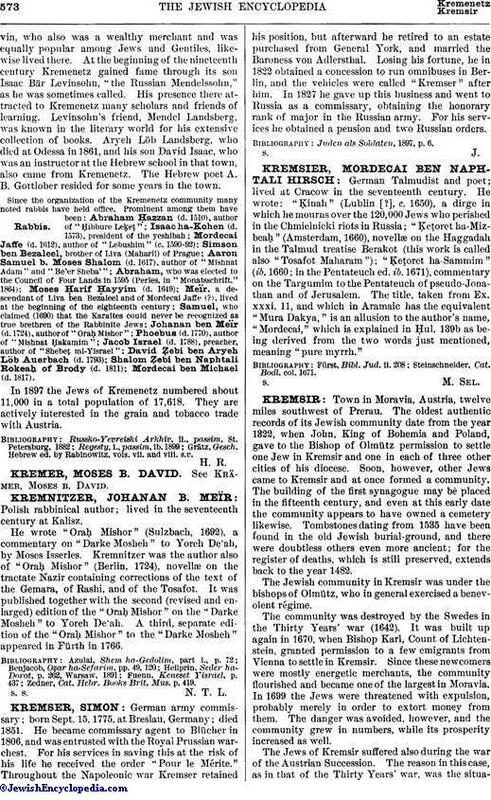 Aryeh Löb Landsberg, who died at Odessa in 1861, and his son David Isaac, who was an instructor at the Hebrew school in that town, also came from Kremenetz. The Hebrew poet A. B. Gottlober resided for some years in the town. Mordecai ben Michael (d. 1817). In 1897 the Jews of Kremenetz numbered about 11,000 in a total population of 17,618. They are actively interested in the grain and tobacco trade with Austria. Grätz, Gesch. Hebrew ed. by Rabinowitz, vols. vii. and viii. s.v.